Three months ago, the wife of a good friend died suddenly, tragically. More recently, an ex-colleague lost her three-year battle with cancer. In both cases, the people who held it all together while families grieved were close friends of the two women who had passed on. They helped organize memorial services, told the caterers where to go, put together slide shows, comforted bewildered children, offered support to emotionally drained husbands. They were nothing short of amazing. Yen didn’t have time for a goodbye note – her demise was just too unexpected. But Shin left behind a letter. Her husband and friends say she always had to have the last word. And what words too. Shin was gracious, funny and inspiring even at her own funeral. She knew her friends would be there for her and she wanted to cheer them on, give them hope, and thank them. Letter from Shin from Lynn Lee on Vimeo. Several years ago, another ex-colleague died of liver failure. A friend who attended his cremation said only three people turned up. Neither his former wife nor his son bothered to make an appearance. Our friend described it as the saddest thing he’d ever seen. What did our ex-colleague do to alienate those nearest and dearest to him? Shin, by all accounts, spent her final weeks surrounded by the people she loved most. Her husband, family and best friends were with her, round-the-clock. They did everything they could to make her comfortable. Yen’s departure led to an outpouring of grief across Singapore – her wake was beautifully and carefully planned. All her closest friends wanted to remember her as the vibrant, sunny girl who had it all, rather than the tragic victim of a senseless terror attack. They gathered one night to drink champagne (her favourite) and trade stories about her. There were so many. At the end of Shin’s memorial, we were all given balloons and told to head outside. Then, at the count of three, we all let go. 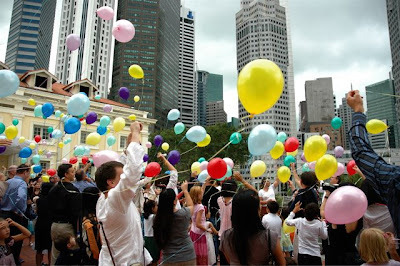 Everyone whooped and cheered as the balloons floated up into the sky, a crazy mass of colours. The kids, especially, loved it. Shin never really believed in the afterlife. But if she had been somewhere looking down that day, she too would have laughed. This uplifting tribute, planned by loving friends and family, was a great send-off for someone who had led a brilliant life.